I’ve been doing this whole woodworking thing for a few years now, and if there is one thing I have learned, and seen preached across the woodworking world as a whole, it is that sharp tools are important. If you have ever had the chance to use a really sharp tool versus a really dull tool, you will know exactly what I am talking about. If you are a newer woodworker, maybe you don’t. Either way, keeping your tools sharp is one of the key components to being a safe and effective woodworker. I recently took a class with Frank Klausz and he shared an anecdote from his youth as an apprentice cabinetmaker that I think illustrates the importance of sharp tools. When he was a young apprentice he would often wait until his Master had left the shop for the day and then experiment with the Master’s planes, using them and feeling how different they were from his own. He would then work at sharpening his planes so that they were as sharp as those of the Master cabinetmaker. It was a night and day difference and taught him the value of sharp tools. The reason I’m talking about having sharp planes and other tools and how important they are is that I recently got to work with a Tormek T3 grinder. The Tormek sharpening system is a brilliant little tool, and I was able to bring one into my shop for a few days and test it out. Setting up the Tormek was relatively simple. It comes with an 8″-diameter 220-grit grindstone that can be temporarily graded to 1000 grit for fine honing by utilizing an optional “stone grader”. Also included is a “square edge jig” that makes it easy to precisely sharpen chisels and plane irons. It also has a leather stropping wheel on the other side that makes final honing very quick and easy. Tormek also sells several different accessories that allow you to use the T-3 to accurately grind different types of tools including gouges, knives, scissors, axes and even planer and jointer knives. One thing I do recommend is that you fill the water tray after you place it beneath the stone; otherwise you might overfill it like I did and get your bench all wet, but lesson learned. 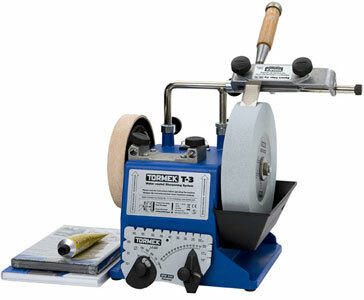 The Tormek is a slow speed sharpening wheel and it also functions as a whetstone, which means your tools don’t get excessively hot which can harm the steel. The system itself was a breeze to use and allowed me to grind my tools to a rather satisfying sharpness. Currently the T3 has been discontinued by Tormek and they are making way for a new system, which will allow the crafty woodworker to take advantage of the fact that Highland currently has some T3’s still in stock. These T3s are going to be moving fast so if you want a new sharpening system that is simple to use and allows you to sharpen your tools to razor sharp angles in just a few minutes I would recommend checking out the Highland website, the T3s won’t be around for long and they have a really great price.